'Tis not quite the season, but here's something for comfort food lovers to keep in mind. Macaroni and cheese flavored candy canes are available to those who want to celebrate Christmas with a twist this year. 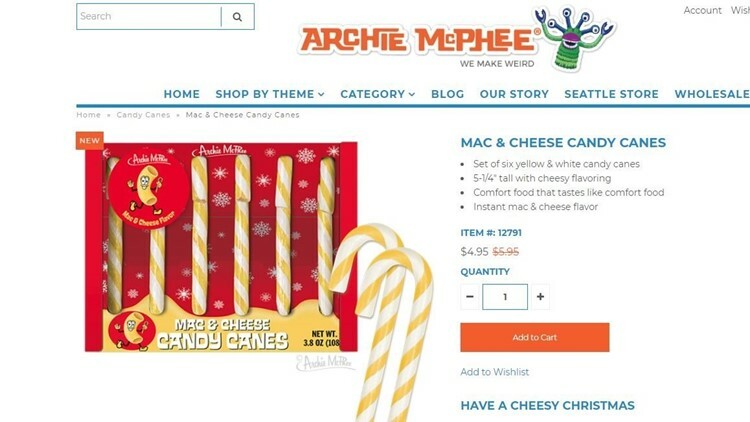 Seattle-based Archie McPhee is selling the candy canes for $5.95 per box. According to the brand's website, the new candy canes have an "instant mac & cheese flavor." Believe it or not, that's not the weirdest flavor Archie McPhee sells. According to its site, Clamdy Canes are also new this year, and yes, the gray and white candy canes are meant to taste like clams. There are also rotisserie chicken candy canes to go with the mac and cheese ones. Why not enjoy a full meal this holiday?